..:: Frame searching thursday GMT ::.. Discussion in 'The Lounge' started by gonefirefightin, Jun 28, 2012.
now that RAAM is over I am need of some downhill time. starting to search the internetz for a new DH frame to build. Whatever you get, ensure you use Sanjuro's patented anti-rust frame saver coating! Quarry shot again today. Good to be out of the office. Happy Thursday, monkeys! Is it Friday yet? Ran 12 miles last night. I wanted to run 15 but was getting side cramps like a mofo. Not sure what was up with that. I haven't felt any cramping in a long time. So, I cut the run short. I am already looking forward to the weekend. Bike rides planned both days. M9 your search is over GFF. Took my last class & presentation for my MS degree last night...just 2 papers to bang out before Monday and I am done! Sunday will consist of me & the kid ringing all kinds of cowbells, triangles, glockenspiels, etc. for the DH finals at the Windham WC!! Things seem to have mellowed out here for now, or at least, it didn't blow up again yesterday like it did on Tuesday. The talk now is 300+ homes were lost tuesday. Hot and dry again though today so Ima keep my fingers crossed. tired of fixing crap that carelss employees break. I also want to know who at the factory decided to dip the shaft treads of a servicable part in red loctite. turned a two minute job into a nightmare. I ended up having to run a tap through the bore to clean all the crap out of the treads and to fix the cross treading done by the factory retards. This week is dragging and cannot end soon enough. I have a feeling next week, other than Wednesday of course, holds more of the same. Today will be another good day for me. My helper salesman is leaving the store today, even though he does not know it, Mayhem is this Saturday, my lady friend is coming over for lunch, and I am signing papers to serve the ex tonight. Although it does seem that she has gone and blown her car up, so I am going to go see how bad the damage is and adjust my offer to compensate her getting my truck so I can afford a new truck etc etc....... Evil I know, while it looks to her I am doing something nice to give her my truck, I am getting the new one and lower alimony payments!!! Got an offer yesterday for a job paying substantially more than my current position, so pretty stoked about that. Have to put in my notice today at my current job, that probably won't be too fun. Got a promotion at the office this week. I've been doing the work for about a month, but the title and pay just kicked in. Oh boy, now I'm in management. I'm beginning to think you're not a people person. TR450 your search is over GFF. Had a good commute yesterday, but the ride home was a little warm (and I was 5 minutes slower?). Decided I will ride Mon, Wed, Fri until I am less sore. <edit> GFF, did you lose the DHR in a move or something? For pure DH, the TR450, for the semi-all-mountain, the TR250. Some of those pictures of the fires are incredible. I can't imagine being there or watching my house burn down. My thoughts go out to those people. I hope they all stay safe. Pretty mellow around here. Another day, another day at work. Actually going mt. biking tonight though! Pretty excited about that! It's nice to have an understanding family who lets me go! And only 2 more days of work and then a week off! Woot!! It won't be all fun and games though. Have to reroof a small house with my brothers and dad! Should be full of entertainment though! I think there will be more bitching and complaining then actual work getting done! well sure... i love my 450, but if you're going through many dh bikes per year, i figure a Zerode should be one of them. Yesterday I rode, drank beer with friends and slept a whole bunch. I have pretty much the same schedule for the next 60 days. 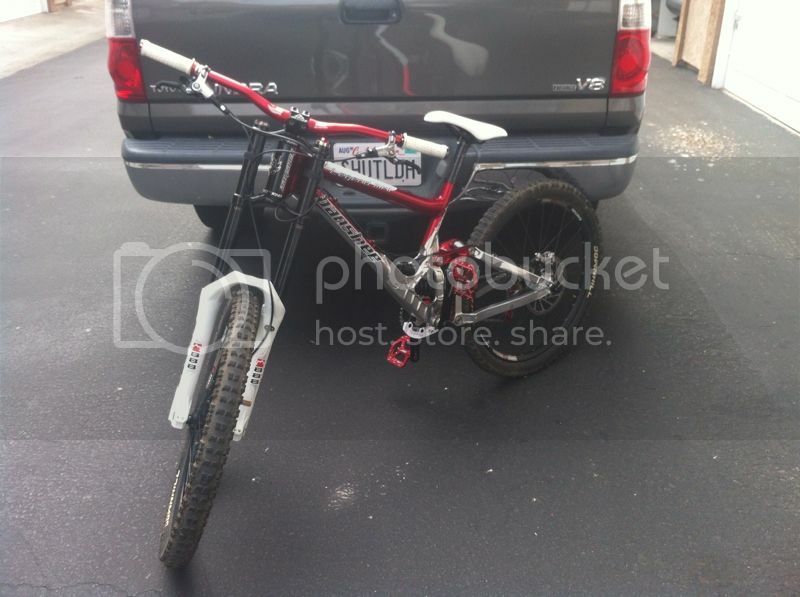 My downhill bike is from 2005! I wish my problem was deciding which new bike to get!! Ahhh! To be young again! I'm guessing out of school? I bet he's older than you. How old IS Westy? I thought he was a punk kid at UW? Or at least still in his 20's? It's Thursday... gotta hit teh gym and pump some iron (I just typed that with Ahhhnold's voice), then maybe hit a trail with the rugrat tonight... or whatever. I do know/respect these guys, they're doing good things and are passionate about it. The frame ain't anything fancy, but it does the job, is reliable so far, and has good geometry. In other news: good afternoon, ya'll. I have clean laundry. Flew into Burlington, VT last night for the sisters wedding this weekend. Nice to be in 70* weather and not 105* and smoky. Should have brought the road bike with me but oh well. Compared to you he is. That still doesn't answer the question fellas. "Answer the question Cllllllllaiiiiiiireeeeeeeee!!!!"